Here is what I'm wearing to my internship today (I took the photos yesterday)! I have a pretty important meeting, not sure how it will turn out, but if things keep going as they are I may fill you in ;) Fall is definitely here, I find myself wrapping up in a blanket in my house because I don't want to turn on the heat yet. But at least it means I get to wear all my sweaters and Fall clothes! I finally had the chance to wear my new Maison Scotch pants, for their first wear I decided to go with a simple look. Next time I'll try to be more adventurous. Those pants are killing me - they look amazing on you! Those pants -- Gahhhhhhhh! It's love. Ohh very chic look! You look sharp and fashionable- perfect for a big meeting at a fashion-based internship. Good luck! Love this outfit! That necklace is so cute & love the pants!! ahhh I need those pants!! SO adorable! Fantastic pants, so cute but they look really comfy too. is this where you live or did you searched for such a place? the mint green house is so sweet! it's a very eyecatchy combination of boho (mainly the pants) and elegant. i love your watch, very trendy! Ohh you look lovely, those pants are great. How neat are those pants?! They remind me of seashells or raven feathers from afar. So neat and ambiguous, that pattern on them is. That is an amazing outfit!! Love your pants !! Awesome pants! You look great! You look so amazing. I absolutely love those pants. I am such a fan of printed pants. Sophisticated mama! You look like Rachel Barry in Glee post makeover! NYC Chic! Meg, this is one of my favorite of your looks. So chic! Hope the meeting went well. Happy Mom Bday! I like this! very cute. Good luck with everything, I hope everything is going well. those pants were such a great choice!! and i love that you've committed to those heels, awesome. hope things went well today! Happy birthday to your mom! 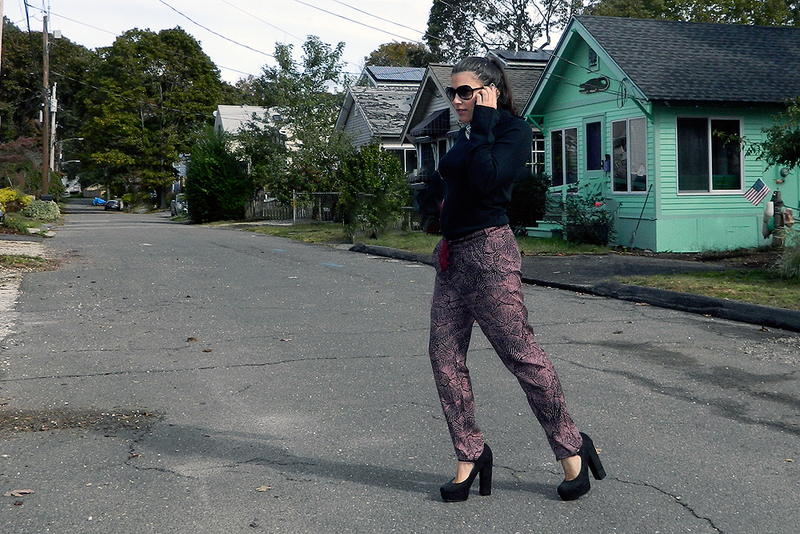 Love the printed pants, and how you've paired them with heels! Your legs look really long! 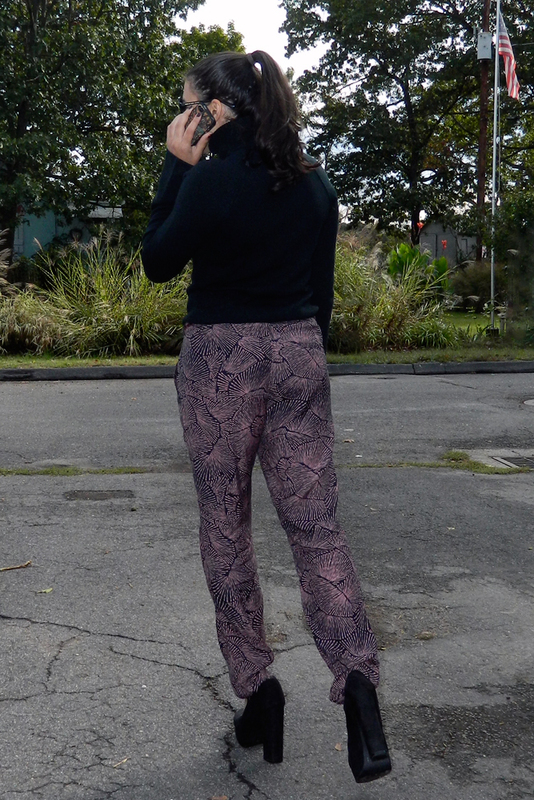 love the pants - great print + the side profile of those shoes.. The fact that you've paired paired Beatles, Marc Jacobs and Maison Scotch makes for a perfect ensemble and awesome vibes! Great outfit! Looks very good on you! UM excuse me, those pants are amazing!!! Those pants are fantastic!!! It's so common to see great prints on tops but so rarely on pants, especially ones cut in a trouser style. I like the idea of keeping the rest of the outfit classic for a professional setting. You look impossibly chic with those sunglasses and classic pony!